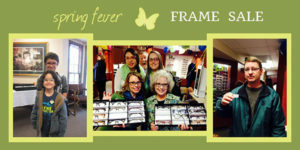 We welcomed an early spring with our Spring Fever Frame Sale which highlighted designer frames from numerous famous brands! It was a busy day, but a rewarding one for several patients who came away with great looking glasses at unbelievable discounts. What a great way to start the spring season in style! 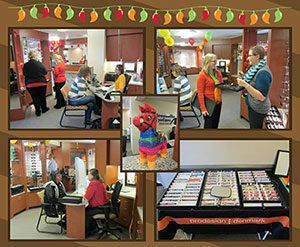 A big thank you to everyone who came to take advantage of the savings and outstanding frame styles. Our recently held Frame Sale Fiesta featured hundreds of designer brand frames at super discounts! Representatives from several lines were on hand to assist with selections and fittings along with our optical center team. The event was a fun way to get a new pair of glasses in the latest styles. Don’t miss our next frame sale event! To celebrate our newly renovated offices, we spent an entire week offering discounts and specials on designer frames while also giving away a few prizes! Daily trunk shows featured designer frames with 50% off all glasses and 25% off all sunglasses. With our newly expanded optical center, we displayed several new product lines including Cinzia, Eyes of Faith, Costa Del Mar, Smith Optics, Marc by Marc and many more. Each day, we held a drawing that gave the winning patient a $100 gift certificate for new glasses! And, we capped off the week by giving away a new iPad! 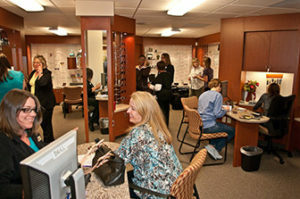 Come see it all at our completely renovated offices and all new optical center. As part of Rosenfeld Einstein’s eight week health emphasis program, “Passport to Health Challenge”, Greenville EyeCare recently participated by giving employees a chance to screen their vision. This was an opportunity to learn more about vision exams and the importance of eye health. Vision screenings were performed to allow the Rosenfeld associates a quick evaluation of how well they are seeing at a distance with their current glasses, contacts or no corrective wear at all. 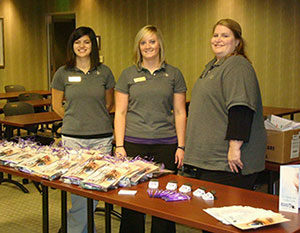 Information about the Greenville EyeCare practice was distributed with ‘goody’ bags filled with cleaning supplies, a magnetic clip and an informational brochure on eye health.